I remember chatting with a professional photographer, who admitted she rarely changed her camera from the automatic settings. She said she didn’t have the time or inclination to learn about depth of field, apertures and shutter speeds, when the camera would do it all for her. I was pretty shocked. How could a creative person give up so much control over her images to her digital camera? Digital cameras are getting smarter every day. They can ‘look’ at a scene and determine an accurate exposure in just about all circumstances. However the camera can’t see beyond the scene to tell the story – and a great photo always tells a story. There is much more to photography than just getting the correct exposure. Anybody can press the shutter button and take a photograph. But a photographer should create the photo – and that means making some decisions before pressing the button. Cameras can be overwhelming. Even many point-and-shoots these days have more bells and whistles than most people know what to do with. I think our reliance on the auto settings has more to do with fear or lack of confidence than laziness. So I am embarking on a quest. I want to teach you some basics, through a series of camera and Photoshop tutorials that will help wean you away from the auto settings and gain some confidence and control over your camera, whether it’s a DSLR or a point-and-shoot. I’m not saying you should never use your auto settings again. There are lots of times that they do a great job and make life easier. The great thing about digital photography is that there is no penalty for experimentation. You don’t have to pay for film or developing for any mistakes – just hit the delete button. So take a photo on auto, and then take control of your camera and experiment with some different settings and see what happens. Let’s go back to the photographer who doesn’t worry about her camera’s aperture setting. By using only auto mode, she is giving up control of the Depth of Field of her image. At its most basic, depth of field means how much of her image is in focus. Let’s look at an example. In the image below, we can see the majority of the tulip is in focus. The aperture setting for this photo is f32.0. I’m not going to bore you with what’s going on inside your camera to make this happen. (If you would like to know more about how the aperture settings work, there are loads of great resources.) What is important here is – the higher the f-stop number, the greater the depth of field. That means there is a wider range of focus in the image. Now let’s look at the same photo only this one was taken with an aperture setting of f3.2. As you can see, the only part of the tulip that is in sharp focus is the stamen. So why is this important? Knowing how your aperture setting is going to affect your photo, gives you more control over the final image. 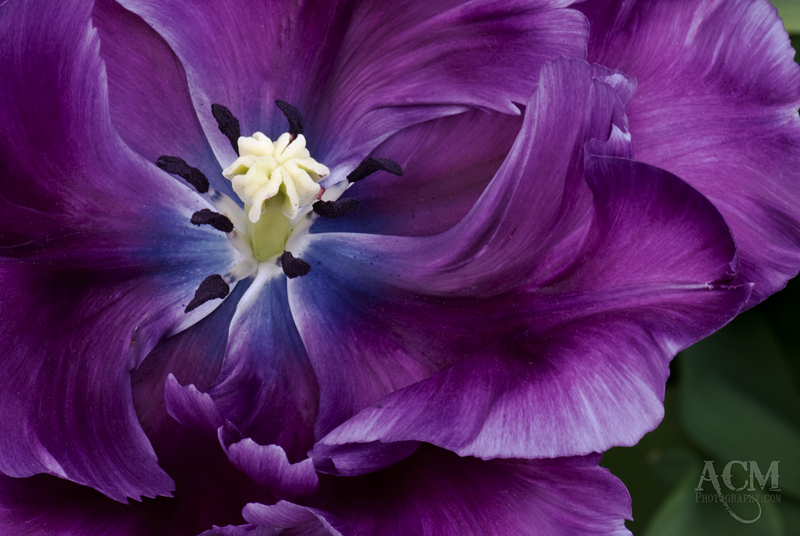 If I was photographing this tulip for a garden catalogue, I would choose a high f-stop (like the first photo) to show customers as much detail about the tulip as possible. However, if I was photographing the tulip to frame as an art piece, I would choose a low f-stop (like the second image) because the narrow focus is stronger and more dramatic. In the end, it’s all a matter of personal taste, but the decision should be yours, not your camera’s. Stay tuned for more articles in the Control your Camera series. This entry was posted on Thursday, May 28th, 2009 at 04:33 and is filed under Tutorials and tagged with aperture, camera, control, depth of field, DoF, f-stop, photo, photography, tutorial. You can follow any responses to this entry through the RSS 2.0 feed.